You’d go a long way to find someone with a good word to say about Lance Armstrong. But in Catalonia, in north-eastern Spain, Lance is still something of a hero. 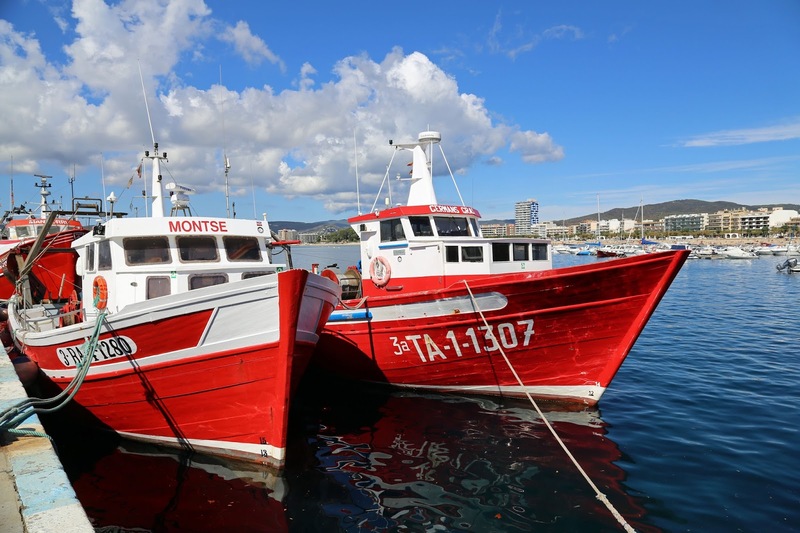 For some years he and his Tour de France-winning team based themselves in Girona, training in the tough Pyrenean foothills behind the Costa Brava, and pouring a lot of their dubiously-gained wealth into the local economy. That’s the last you’ll hear from me about Lance, except to note that the resulting popularity of cycling is a good thing for riders here. 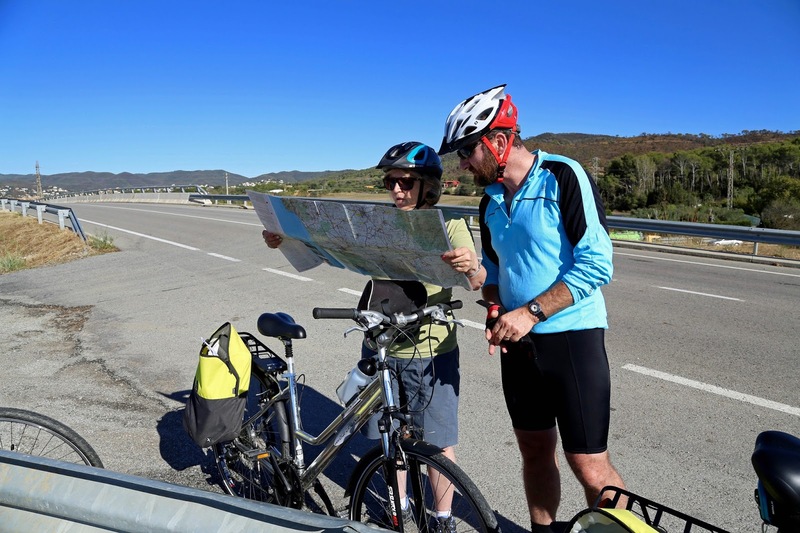 Catalan drivers afford cyclists amazing courtesy. It’s also the last you’ll hear about tough hills. 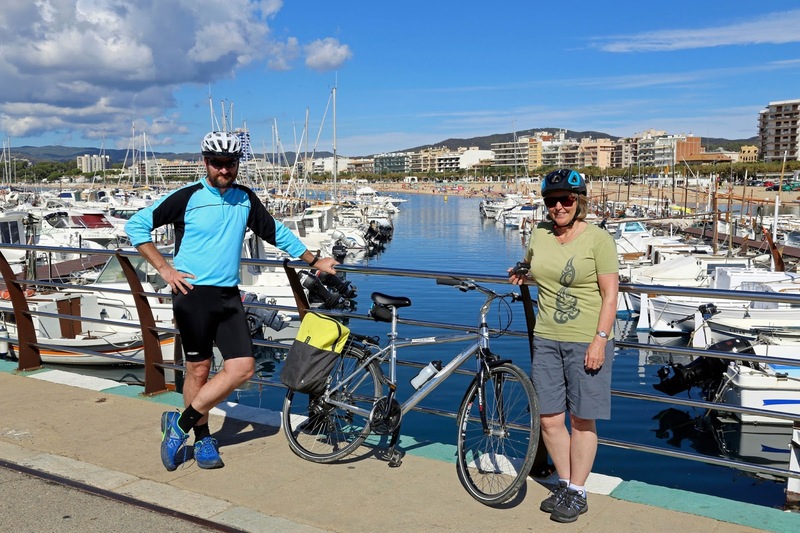 The three of us, myself, my wife Lynne, and our old friend Chris, are in Catalonia for some decidedly more relaxed cycling. The area is not only sunny and beautiful, it also has a maze of off-road cycling trails. Rather than cycle touring, we’re based for the week in a townhouse in the old village of Calonge, a short ride inland of the resort town of Palamos. From there we can explore a wide area, but return each night to our comfortable base. We’ve exchanged Tasmania’s spring, a time of wild winds and riotous wattle blossom, for the settled warmth and pale fields of a Spanish autumn. 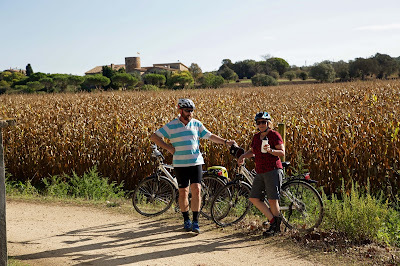 On an early ride we pause in a maize field. Its foliage has browned, and the ripe husks rattle in the breeze. A Catalan flag flaps lazily from a nearby tower, reminding us we’re in Catalunya rather than Spain. Our local host has encouraged us to greet the locals with bon dia rather than buenos dias. Given the brutality of the Spanish Civil War, and General Franco’s vigorous attempts to outlaw Catalan language and culture - right into the 1970s – this is no mere nicety. It is strange to be riding through such beautiful tranquility knowing that within my lifetime it’s also been the scene of heartless repression. More familiar is my feeling of disorientation here in the northern hemisphere. Whereas at home I have an intuitive knack for knowing my way around, in this part of the world I’m easily lost. It probably comes down to where the sun is in the sky. Here it leans in from the south; at home from the north. Without thinking I use the sun to help me to know where I’m going, so here I become Pedro Equivocado*. I’m glad to have Chris and Lynne with me: Chris with his long experience of this hemisphere (originally from Tasmania, he’s been working in England for decades), and Lynne with her more logical take on navigation. Our days, and our paths, are divided between coastal rides and hinterland rides. We start with some easy coastal rides. 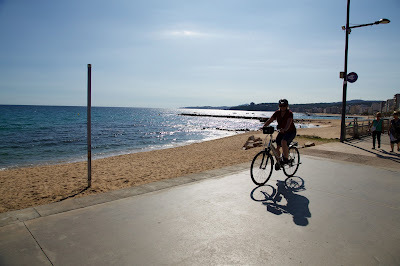 Although Costa Brava literally means “wild coast” or “rough coast”, it doesn’t take us long to decide that nomenclature came from sailors rather than cyclists. The broad and pleasant beachfront at Palamos has largely been concreted and tamed, its main street crammed with hotels, shops and eateries. Although we’re not here in the high tourist season, it’s still buzzing with people and bursting with boats. We pause for a coffee and to enjoy the kind of vibe we’re unlikely to choose for the long term. Of course there’s more to Palamos than the beachfront. It’s one of the few working ports in the region. Fishing boats take pride of place at the eastern end of the bay, where there is also a fishing museum. Nearby the “old town”, with its pleasantly higgledy-piggledy streets, is packed with shops, some for tourists, some more for the benefit of the locals. We ride around the coast from here, and start to see some of its more rugged aspects. The already contorted metamorphic rocks have been further hammered by wave action, creating a deeply indented and rocky coast interspersed with sandy bays and beaches. We’ve been told that one, Platja del Castell (Castle Beach), is particularly beautiful, and one of the few “untouched” beaches left in the Mediterranean. We have to work a little to get there, as it’s somewhat off the beaten track and the sun is beating down strongly. Once there we’re happy to pause for a long drink and lunch. As we cool off, we have to agree that it really IS a lovely beach. But “untouched”? Backed by a little forest, with just two buildings immediately adjacent, the beach certainly retains a natural prettiness. But today there are hundreds of people, dozens of boats, a couple of demountable cafes, plus walkways and toilets. And yes, there are quite a few cyclists too. As we munch our calamari and sip our beer, I have to acknowledge afresh how tamed the Mediterranean is. With its ancient record of human settlement and exploitation, and a surrounding population that approaches half a billion, I shouldn’t be surprised. There is a constant human pressure and presence here. You might consider the Mediterranean world a small scale experiment in what we’re doing to the wider world. Forests and wildlife have retreated to remote pockets, mostly at altitude. As for this small sea, its exploitation is a guide to what may happen – has begun to happen – to the vast oceans we’d like to think of as invulnerable. 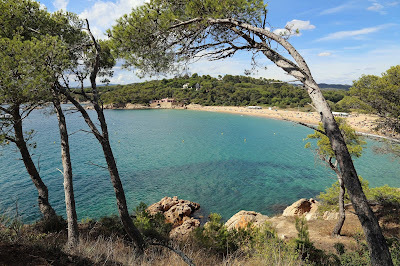 That’s reinforced a few days later when we decide to have our first swim in a little cove closer to Palamos. As we’re getting into our swimming gear, we notice a group of older men scooping something out of the water with little nets. There’s a language barrier, but it’s clear that they’re removing stinging jellyfish from the water. 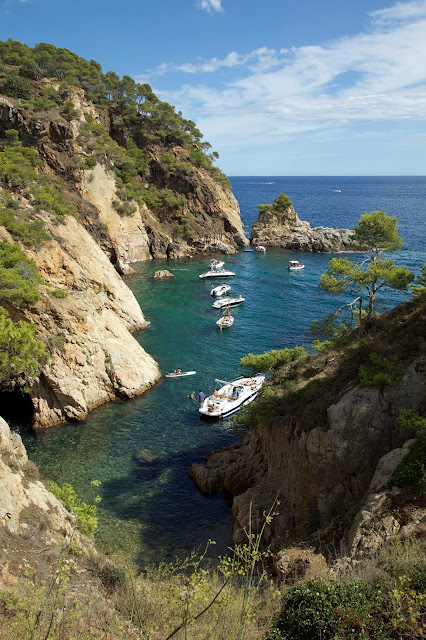 After a while they signal, and tell us – we think – that we might try a dip in one corner of the cove. We ease ourselves into water that most Tasmanians would find acceptably warm. In other words it’s cold. The sand is coarse and hard on our feet, and its littered with waste. And in the water there’s plenty of plastic flotsam alongside the occasional jellyfish. Soon after we take the plunge Chris winces, pretty certain he’s just been stung. It’s not the perfect recipe for a long swim, and we soon decide we’ve had our Mediterranean swim. As we click through the gears on the ride home, I see that for me as a Tasmanian, this trip is also about making mental shifts. I have to stop expecting wild, and settle for pretty; to turn down the nature knob and crank up the culture one. 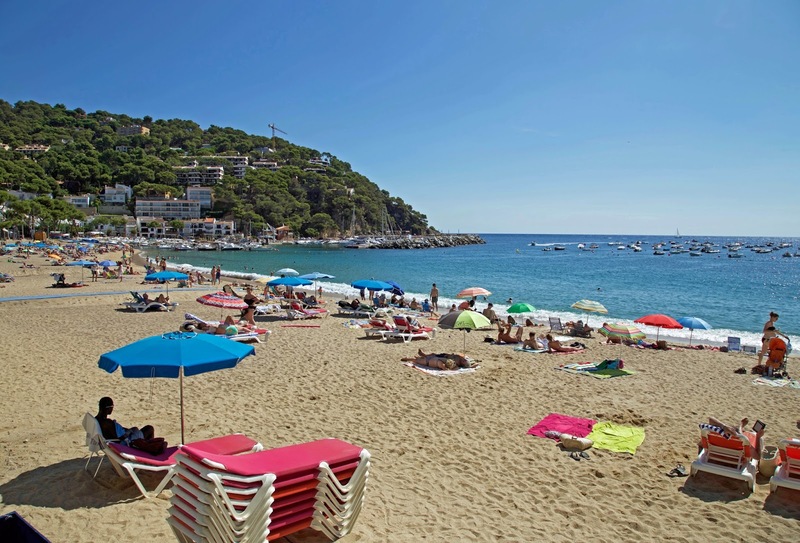 Because there’s no doubt the Costa Brava has both of those, as we discover yet again at beautiful seaside villages like Calella and Llafranc. And as we’ll find by the spadeful when we venture into the hills.